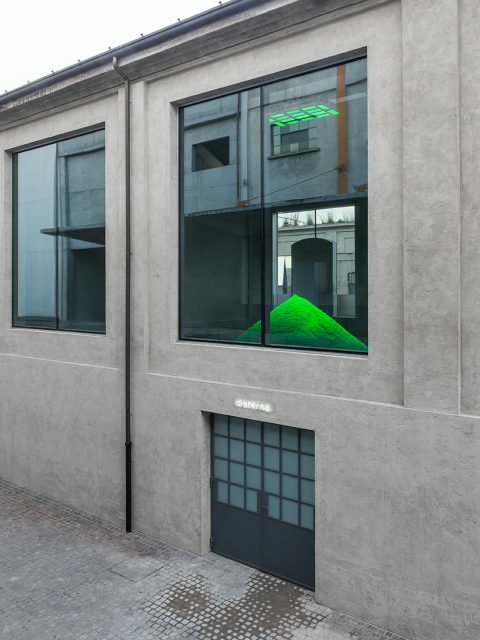 Curated by the Fondazione Prada Thought Council, whose current members are Shumon Basar, Cédric Libert, Elvira Dyangani Ose, and Dieter Roelstraete, “Slight Agitation” continues with a second instalment by Pamela Rosenkranz (Switzerland, 1979). She follows on from Tobias Putrih (Slovenia, 1972), while Laura Lima (Brazil, 1971) and Gelitin, the Austrian collective active since 1993, will produce future chapters. 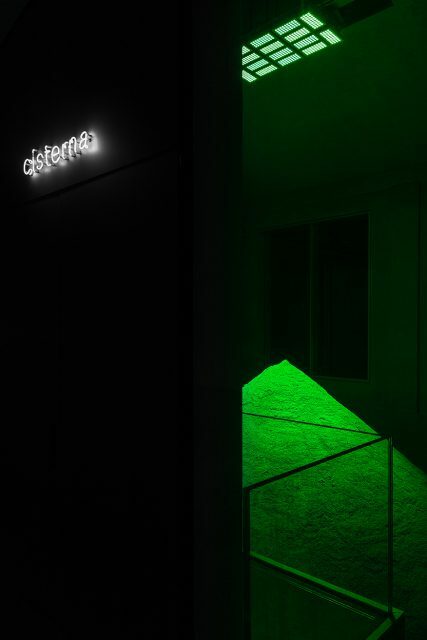 Pamela Rosenkranz’s work explores how physical and biological processes affect art. Her installation Infection is based on a neuro-active parasite, of which an estimated 30% of the world’s population is affected. A huge, almost sublime mountain of sand is formed inside the Cisterna’s tall spaces. Its scale pressuring against the historic architecture. The sand is impregnated with fragrance of synthetic cat pheromones that activates a specific, biologically determined attraction or repulsion and subconsciously influence the public’s movement. RGB green light illuminates the peak of this chemically altered nature gently evaporating the scent. Following Tobias Putrih’s instalment—which engaged with ideas of play, politics and emancipation—Pamela Rosenkranz’s chapter continues the Thought Council’s interest in “agitating” the mind and body, senses and space. Rosenkranz’s intervention will be perceived at different distances, which heighten and alter the architecture of the Cisterna. The circular plan, and chemical investigation, is an oblique memory of the Cisterna’s alcohol distilling vats that were formerly housed there. 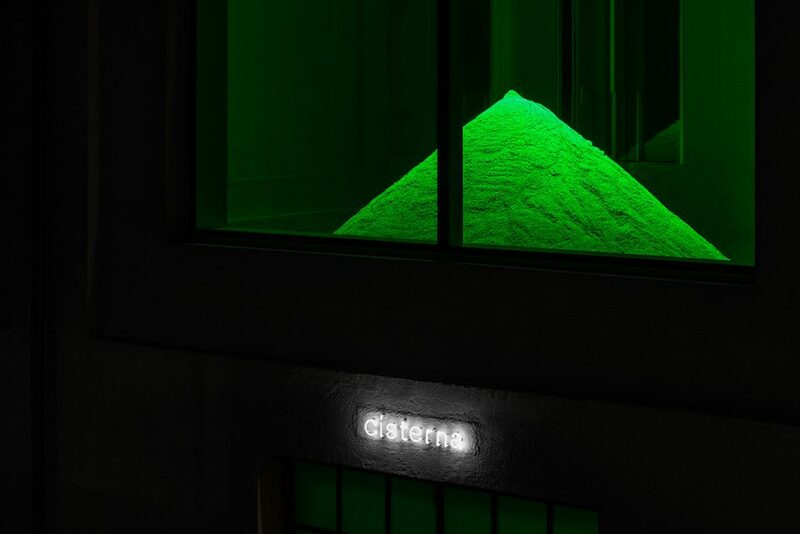 The green light leaking through the Cisterna’s windows, transforms the building into a vitrine, a luminous object sensed from the outside. It will intensify as day turns to night, engaging with the Fondazione’s nocturnal character. 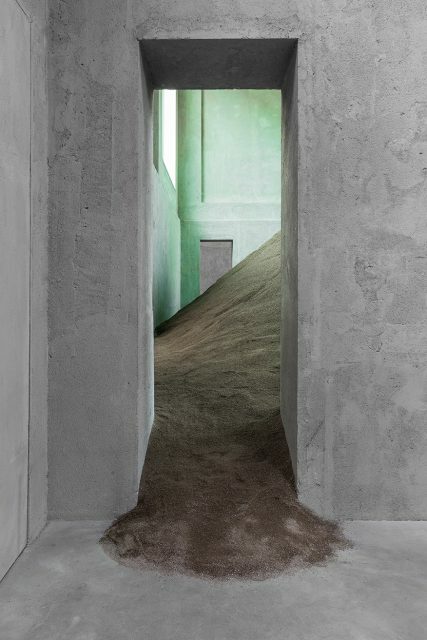 Members of the public will have a direct, intimate experience of the sculptural intervention from a number of angles: at ground level and also from above, emphasizing the formal qualities of the Cisterna: its volume, its heaviness, its religious invocation. An uneasy feeling around biological determination will engage multiple senses: smell, heat and coldness, mass and density, light and its absence. 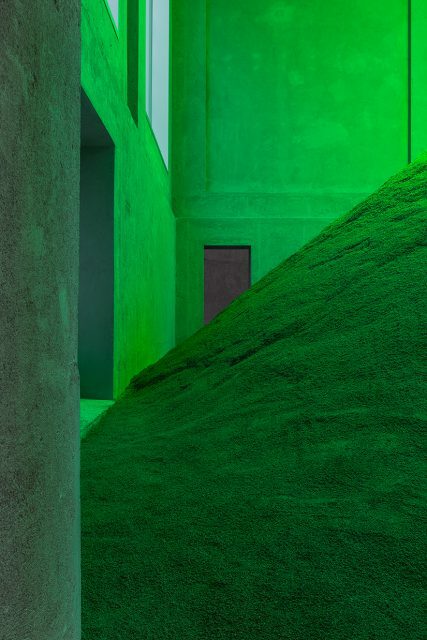 Pamela Rosenkranz’s intervention furthers the ambitions of “Slight Agitation” by offering immersion into a new sensation of embodiment and collectivity.